A new test introduced in July last year has been failing to identify donors with an iron deficiency. 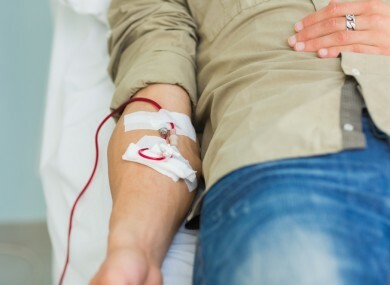 THE IRISH BLOOD Transfusion Service has revealed it has identified a problem with a new test it introduced in July 2014 which failed to identify all donors with anaemia. The test was used to check haemoglobin levels in potential donors and Dr William Murphy, medical and scientific director at the Irish Blood Transfusion Service, told RTÉ’s Morning Ireland it had been tested on 945 donors before being introduced across the service. However, it has now emerged the test missed a subset of donors, predominantly women with the iron deficiency anaemia. Dr Murphy said these women continued to return to donate despite the fact that they had severely low iron levels in some cases. This only emerged when one donor contacted the service to say she had to go to her doctor “because she was profoundly anaemic”. Murphy said a unit of blood had been taken from this woman just a week earlier. On making the manufacturer aware of the issue, he said they were told there had been a similar case in Germany, which the company had failed to disclose until the Irish service got in touch. “It’s more than concerning, this is really very serious. We’ve been exposing donors to developing anaemia, donors who were not fit to donate were donating, they’ve been passing this test,” he said. Murphy said any costs will be covered by the blood transfusion service and urged any woman who has donated blood and who is feeling ill to go to their doctor. Anyone who believes they may have been affected can call 1850 731 137. The maufacturers have said a software update should remedy the problem, but this will have to be validated so the service will return to the traditional prick test until then. For now, the service has suspended taking donations from women who have given blood in the last 18 months and is urging more men to come forward in the meantime. Email “Irish Blood Transfusion Service: 'We've been exposing donors to developing anaemia'”. Feedback on “Irish Blood Transfusion Service: 'We've been exposing donors to developing anaemia'”.